Economic recovery following a recession is almost always characterized by rapid employment growth, not this one. In an effort to boost demand, central banks across the globe, and especially the U.S. Federal Reserve, have pursued easy money policies in the wake of a worldwide financial and economic crisis. Despite these efforts job creation continues at a tepid pace compared to recoveries from prior recessions. Over the past decade the U.S. production of self-degreed constitutional scholars as well as Federal Reserve haters has grown exponentially. I am neither. The Fall of 2008 was a frightening time for anyone with even a cursory knowledge of the U.S. and world financial systems. The Federal Reserve’s actions, along with other central banks, helped avoid an unimaginable calamity and while I am no Fed hater it is appropriate to consider the Fed’s policies in the three plus years since the Fed did what it needed to do to avoid a financial catastrophe. 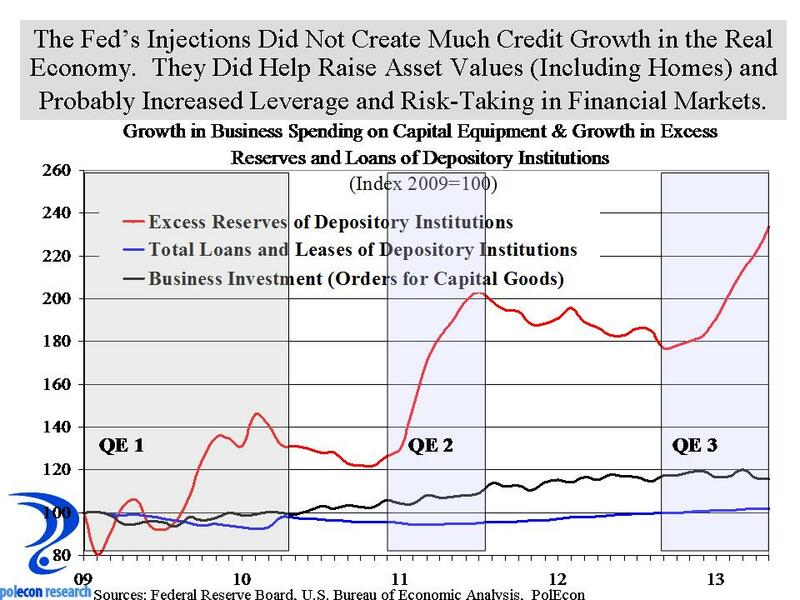 The Fed first began injecting liquidity into the financial system by purchasing the assets (loans and securities) of financial institutions (quantitative easing or QE 1) as the financial crisis and recession were taking hold. This helped assure that there would be a supply of funds available to fuel the credit needs of the economy at a time when many banks were badly weakened and most were unwilling to lend even to each other. 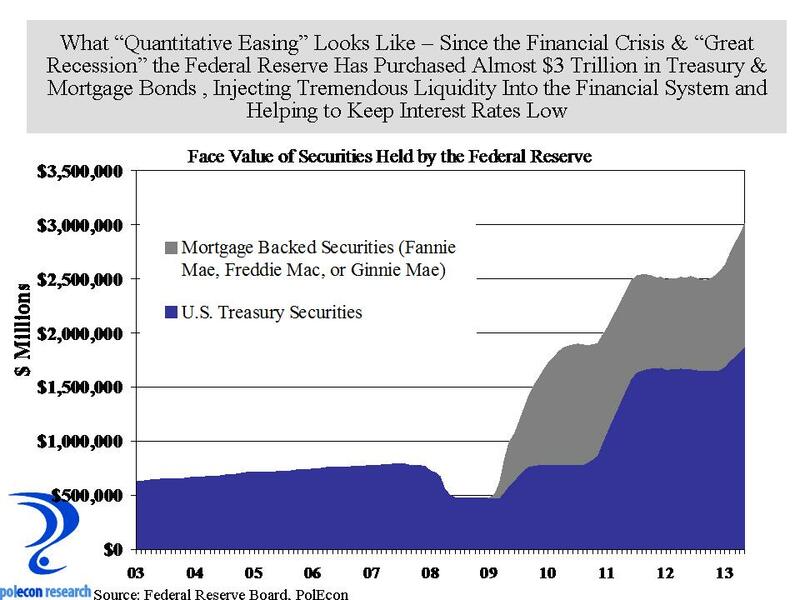 As the chart below shows, the initial round of quantitative easing was followed by a continuation of purchases of mortgage backed securities (MBS) and treasury notes and bonds (QE 2 and QE 3), tripling the size of the Federal Reserve’s balance sheet. The increase in demand for MBS and treasuries helped boost the price of these assets pushing their yield down and keeping interest rates in the economy low. The problem is that the Fed’s liquidity injections have not created credit or the demand for credit in the real economy, but rather they have increased leverage and risk-taking in financial markets. They have also helped increase asset values. Increasing the value of stocks and bonds and especially homes is a good thing but as a method of stimulating the economy, not especially efficient. Fractional reserve banking means that every dollar available to a financial institution can result in many more dollars in loans. Every introductory economics student learns that the rapid expansion of the money-supply inevitably fuels inflation – except in this case it has done neither, at least thus far. Inflation has remained subdued at roughly 2% because there is still a substantial amount of slack and a lack of demand in the economy and because banks are not using their swelling reserves to expand credit and increase liquidity. This is not at all an indictment of banks. They are responding to the tepid demand for credit at a time when de-leveraging has been the norm. Banks earn 0.25% on the excess reserves (the fractional reserves in excess of those required to be held based on the volume of their loans and other assets). With interest rates at historic lows, de-leveraging occurring among businesses and consumers, and at a time when banks face increasing scrutiny and regulation, we should expect that banks would be most willing to lend to the government and large stable corporations and less likely to extend credit to riskier borrowers like small businesses, start-up companies or first-time home buyers. The chart below shows how the excess reserves of banks have grown with each round of quantitative easing, along with growth in the loans and leases of domestic banks, and growth in capital equipment purchases by U.S. businesses. The chart suggests that about 2% of the liquidity injected into the financial system during QE 2 and QE 3 has been circulated into the economy, while the rest sits idle. The last time, interest rates were too low for too long (2001-2004) the result was huge bubbles in credit, housing, and equity markets and we know how that movie ended. As the Fed begins to reduce its purchase of securities, the stock and bond markets are reacting with fear, too bad, its time for a movie with a better ending for the “real economy” and that will take policies that don’t just satisfy financial markets. This entry was posted on June 21, 2013 at 11:12 am and is filed under Banks, Federal Reserve, Monetary Policy. You can subscribe via RSS 2.0 feed to this post's comments.